For the past few years, it seems like the Internet has been abuzz with talk of “superfoods.” These are not just fruits and veggies as one might surmise, but any food that is packed with additional vitamins, nutrients, or other added bodily benefit. Your parents have been telling you that broccoli is good for you for years and as it turns out, they were right. As a carotenoid, broccoli helps rid your body of harmful compounds. It also contains high levels of sulforaphane, which flushes cancer-causing chemicals from the body. This just in: Fermented foods are really good for digestive health! Most people don’t think of things like sauerkraut, kimchi, and pickles as anything more than condiments or other, tastier foods, but the resultant bacteria of the fermenting process creates myriad benefits. These include high levels of anthocyanin and Vitamin K and detox compounds. Cartoon or not, Popeye knew what he was talking about when it came to the strengthening powers of spinach. Not only is spinach packed with a whole mess of iron, but a half-cup of this leafy, tasty vegetable also provides more than five times your daily dose of vitamin K, which is good for your blood to clot and strengthens your bones. These tasty little berries are more than just toppings for frozen yogurts and parfaits, they also happen to be loaded with ellagitannins, a type of phytochemical that scientists believe might actually halt the growth of cervical and colon cancers. Might be a good reason to reach for strawberry next time you’re choosing ice cream flavors. They say that an “Apple a day keeps the doctor away” and in some ways, that idiom speaks the truth. Apples contain quercetin, an antioxidant that may reduce the risk of lung cancer. They are also loaded with a number of other vitamins including ascorbic acid, vitamin C, and potassium. For those who are dieting, they’re a healthy snack that tends to keep one full just a bit longer. Avocados have been in vogue for the past few decades and there’s a good reason for their somewhat sudden popularity. Avocados contain a ton of healthy fats that not only keep one satisfied, they also assist the body in absorbing other good nutrients. Avocado oil is also an even healthier alternative to the already very healthy extra virgin olive oil. Hackneyed as it may seem, our cousins the apes have been onto the big banana secret for some years. Not only do they taste amazing on their own, they also happen to be a reasonable white sugar alternative in a number of healthy confections. They’re also high in several types of good-for-you fiber that might aid in regulating weight gain. There are few foods on this list more tasty and good for your digestive health than that of the prickly pineapple. These sweet though spiny fruits contain high amounts of dietary fiber, Vitamin C, and bromelain, all of which aid in digestion. They can also lower cholesterol and add a significant boost to the immune system. Who says chocolate can’t be good for you? Dark chocolate has been linked with cognitive, physical, and emotional health for a number of years now. In small amounts, it can reduce blood pressure and inflammation and if consumed daily, has even been linked to a reduction in nonfatal strokes and heart attacks. Scallops are not for everyone but they have a very distinct flavor and if cooked properly, can be quite delicious. Deliciousness aside though, they also happen to be a healthy source of protein, containing 14 grams of it in just a 3-oz, 75-calorie serving. Because they contain copious amounts of vitamin B-12, they’re also good for your heart and blood vessels. We could go on and on about the myriad health benefits of salmon, but most of you know them already. A 3-oz serving contains not just good protein but all of the heart-healthy omega-3 fatty acids that a single person needs in a day. Wild caught salmon also happens to be a fine source of potassium and selenium, which is good for thyroid function. Regular potatoes are OK, but if you really want a sweet, nutritious tuber with only a bit of added blood sugar, your best bet is to reach for a sweet potato. This root vegetable is loaded with high amounts of vitamins A and C, fiber and potassium. Like some of the other veggies on the list, sweet po’s contain carotenoids, which have been proven to help fight some types of cancers. Tomatoes, in general, are loaded with lycopene, which the ketchup industry has been taunting as heart healthy for years. In general, this is true, although most ketchups contain far more sugar than is necessary. Tomato sauce, which generally contains garlic, onions, and other vitamin-rich spices, can do the same thing and it’s way better for you. Soybeans can be found in things like tofu, soy sauce, and any number of other food products throughout your grocery store, but if you want the good stuff without the bad, reach for plain old steamed edamame. A single cup of edamame contains a whopping 22 grams of plant protein, fiber, folate, and cholesterol-lowering phytosterols. Those in the know use olive oil in a lot of different foods, not just for the flavor but because it delivers a significant amount of heart-healthy monounsaturated fat. Reach for extra virgin olive oil whenever possible, but if you can’t get some olives themselves, which offer the same benefits at only 7 calories per jumbo olive. Oats and oatmeal are a nutritious, heart-healthy, easily-digestible, whole-grain food that will not only pack your body with everything it needs to start the day but will keep you full longer than your average breakfast cereal. Steel-cut oats are often the best for this last benefit because they are less processed and therefore digested more slowly. Doctors have been on the fence about the miraculous egg for decades now. First, it was good, then it was bad, now it’s good again. Turns out the original egg defenders were right all along. A single egg contains 6 grams of protein with only 72 calories. It’s no wonder these protein-rich little buggers are recommended for many successful weight loss strategies. Blueberries contain antioxidants which reduce the potentially harmful effects of free radicals on the body. More than that, they can boost brain power, improve learning and fine motor skills, regulate blood sugar, and might even reduce the age-related symptoms from dementia if the current studies are correct. There is a reason that the “grapefruit diet” was so popular years ago. Eating mostly grapefruit will provide you with a boosted immune system, high amounts of vitamin C, and a much healthier hearts with a fraction of the calories; it just won’t keep you full. It will, however, protect against Alzheimer’s disease, lower cholesterol, and maybe even fight breast cancer. Despite the fact that they’ve been sitting on dining room tables for the past few hundred years, walnuts are another of those superfoods that folks are only just beginning to appreciate. Walnuts are full of omega-3 fats which can improve memory and coordination. Just 14 walnut halves provide more than twice your daily dose of the omega-3 fat, alpha-linolenic acid. They, them being parents and doctors throughout time and memorial, have said that eating more carrots is good for your eyes. This is absolutely true and we’ve even proved it, but we’ve also recently proven that eating more carrots can improve and repair skin as well as regulate blood sugar. They also contain carotenoids, which have been proven to prevent cancer. Some people think that brown rice is better for you than white. The thing is, white rice isn’t bad for you per se, it just doesn’t have nearly as high a concentration of magnesium and other vitamins as it’s darker counterpart. Either way though, the nutritional difference between the two is mostly negligible, like any carbohydrate, it should not be eaten in excess. Most of the time, the only experience normal folks have with these cute, fuzzy little fruits is to eat them first when they see them in a fruit salad. You know, before you eat the good stuff. But kiwis have recently proven to be a high source of vitamin C, which helps the immune system. They have also been proven to reduce asthma-related wheezing in some patients. Experts have been singing the praises of Greek yogurt for a while now, but recently another bacteria-based beverage has become even more popular. 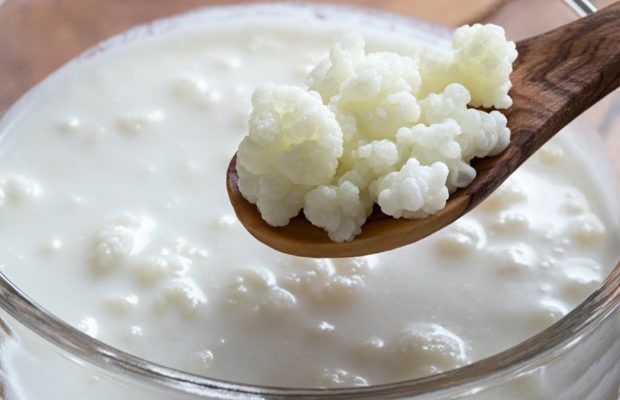 Kefir is a fermented dairy beverage that, while popular in Russia for centuries, has only recently become widely available. Its high probiotic content means it contains oodles of digestive health benefits. Ginger is not just a flavor additive for East Asian cuisine. It also happens to be one of the most healthy ingredients in the world. This anti-inflammatory rhizome is great for treating nausea, pain, and even prevent certain diseases. It also happens to be delicious in soups, sauces, ales, teas, and of course, cookies. We’re not advocating that you drink too much coffee, mind you, but it turns out that a little bit of caffeine would not go amiss. The coffee itself is loaded with antioxidants and caffeine, which can be a mild anti-inflammatory. It has been shown to help improve a range of symptoms and can even be helpful in fighting off brain-related problems like Parkinson’s disease. If you like sushi then we have good news for you. Turns out that the seaweed in your seaweed salad is both high in nutrients and exceptionally low in calories. Because of this, many western companies have tried incorporating the unusual ingredient into things like bread, chips, and soups, in order to introduce more people to this delicious, though unique-tasting superfood. Pomegranate seeds are fun to eat, sweet tasting, and low in calories. This means that they are a very healthy alternative to grabbing a couple of chocolate chips when you run in the house. Like blueberries, they are high in disease-fighting antioxidants and improve blood flow. High in fiber, pomegranate can also help with digestive health and regularity. Lentils are tiny little legumes that are packed with more vitamins and nutrients than you’ll know what to do with. They come in a number of different varieties but are a great source of meat-free protein. In fact, a half-cup of cooked lentils delivers nearly half our daily dose of folate and thiamine. They are also slow to digest, which is good for people with diabetes. Because of their phenomenal flavor, people put onions in just about everything. Indeed, they are so common in the culinary world that they are sometimes one of the most overlooked superfoods available. These odiferous veggies are packed with sugars and nutrients that help protect the cardiovascular, nervous system, and hormone functions. Like pineapple, papaya is a tropical fruit loaded with digestive benefits such as anti amoebic properties. These nutrients contribute to regular bowel function and fight off disease-causing free radicals. They are also rich in key flavonoids that help our bodies fight cancer cells and prevent oral cavities. Honey has been used for its anti-inflammatory and antibacterial properties since the time of the ancient Egyptians. Though it’s essentially bee backwash, this sweet, sticky substance has recently been proven to prevent reduction of white blood cells. It’s still used in cooking and many over-the-counter medicines today. As it turns out, curcumin, the active compound in turmeric, is associated with several medicinal effects. The positive medicinal effects of this amazing orange-colored spice have only just begun to become apparent in recent years. People have become so enamored by it that they’ve begun putting it in just about everything, including coffee. Brussel sprouts are loaded with glucosinolates, more glucosinolates than any other vegetable. These miraculous compounds fight cancer and detoxify our bodies. More than that, if prepared properly, they taste delicious. They are especially good if pan fried with olive oil, garlic, and onions; all of which are also on this list. Based on what we know about European history, many might surmise that cabbage is some sort of pauper’s food. And frankly, there is no denying that cabbage is cheap, but it’s also full of fiber, antioxidants, and cholesterol-fighting agents. Kidney beans are protein-rich, complex carbohydrates that also happen to contain an impressive amount of antioxidants, copper, folate, iron, magnesium, manganese, phosphorous, potassium, and zinc. Many beans contain similar amounts of vitamins, minerals, and proteins, which may explain why armies the world over have used beans as rations for centuries. Acai berries are a fairly-recent foodstuff as far as the western world is concerned, but a delicious one. Even a few thrown into your morning smoothie can provide you with a great number of anthocyanin antioxidants, which are great for your blood. They also happen to have a really sweet, delicious taste. Be careful though, they stain. Salty and smelly, sardines aren’t what most people think of when they think of a delicious healthy snack. Yet despite the high mercury content contained in many canned varieties, a few of these little fishies can provide a person with more than 100% of their daily vitamin D and a ton of omega-3 fatty acids. Everybody talks about the health benefits of salmon, but people don’t understand that tuna, salmon’s much more common counterpart, is just as jam-packed with omega-3s. Considering that doctors are still suggesting that folks eat less meat, digging into some healthy, low-fat tuna is a great alternative.